Fresh tuna is a versatile and delicious fish, but you may want the convenience of preserving it to use over the course of a couple of weeks. Preserving tuna is an ancient art, perfected by the Italians thousands of years ago. Even today, the finest canned tuna comes from Italy and Spain. What separates these cans of tuna from most of the varieties on the grocery store shelf is that they are preserved in olive oil instead of water. Commercial canners often steam their albacore—which is the primary species used in canned tuna—but you will get a far more luxurious result if you slowly poach the fish in olive oil, a process that the French call confit. This is an easy process as you will only need a deep pan, thermometer, cheesecloth, olive oil, and herbs. Your confit tuna will then keep in the refrigerator. To start, you need high-quality albacore or yellowfin tuna. You can follow this method with other kinds of tuna, too, as well as mako shark, halibut, swordfish, or sturgeon. Cut the fish into large chunks about 1 inch thick, and salt them well. Now you need to get your oil ready. Basically, you want to infuse it with flavor and cook it long enough to make the oil stable. To 3 cups of olive oil add 2 sprigs of fresh thyme, 2 tablespoons kosher salt, 2 cloves garlic, crushed, 1 sprig of fresh rosemary, zest of one lemon (sliced into strips), and 1 whole clove. In a saucepan, heat the oil mixture slowly over medium heat until you begin to see the herbs just start to simmer. The temperature should be about 160 F. Hold this temperature for about 15 minutes, then turn off the heat and cover the pot, leaving the oil to cool. Once the oil has cooled (which can take about 30 minutes), turn the heat back on to medium and heat the oil to 150 F. Slip in the fish and arrange the pieces in one layer. The fish must be completely covered in oil. Turn off the heat and cover the pot again. Let the fish steep in the oil for another 30 to 45 minutes. After the fish has steeped in the hot oil, use a slotted spoon to remove it to a clean plastic or glass container. Let the oil cool to room temperature, then strain it through a piece of cheesecloth and pour it over the fish. Make sure you do not include any liquid that the fish gave off during cooking; you want only the oil to cover the fish (use more clean oil if there is not enough). Covered this way, the fish will last in the refrigerator for two weeks. If you want it to last longer, you must pressure-can it in a steam canner. Follow your canner's instructions. 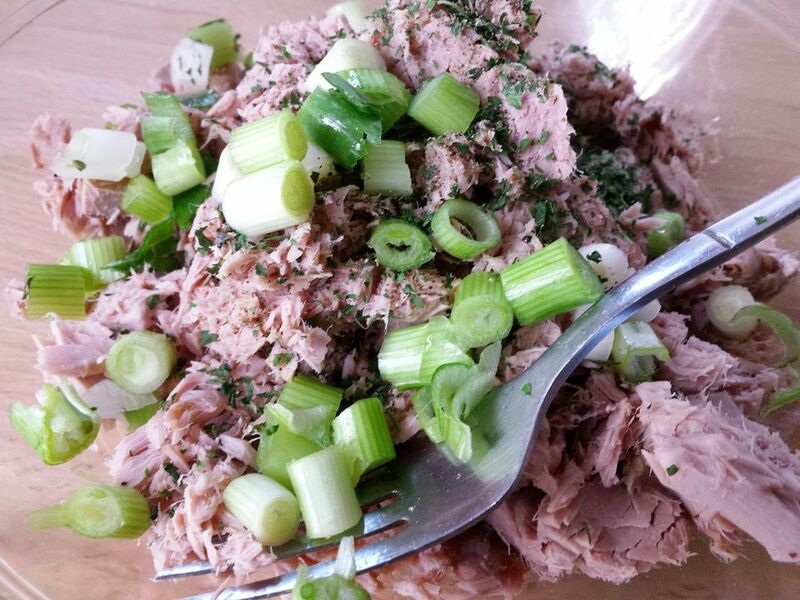 You can now use your homemade "canned" tuna the way you would if you bought it at the supermarket (but your recipes will taste so much better). Keep it au naturel and make a salad Nicoise, complete with potatoes, green beans, anchovies, olives, and your favorite vinaigrette. Or see how much more flavorful your tuna salad will be. This is also the perfect time to try a pasta dish with tuna fish.